Our new member at JayDee's PHS and very first "breed-back" puppy we have ever taken, Gracie is sure to win the hearts of everyone she meets, living up to her name! I first met Gracie, when she was 6 or 7 weeks old and instantly thought she was a neat little pup. I never thought she'd end up to be mine, as she was for sale by her breeder. Well, for some roundabout reason, she picked me and was meant to stay! It was suggested early on that she were to maybe stay with me, and so I hemmed and hawed about it. Then I met her "big brother" (from the first breeding of their parents), "Kyland". What a handsome dude, and I recognized so many similarities between him and this cute little puppy. Well, love & cuteness won my heart, and her spunky little personality surely helped too! Gracie was mine. 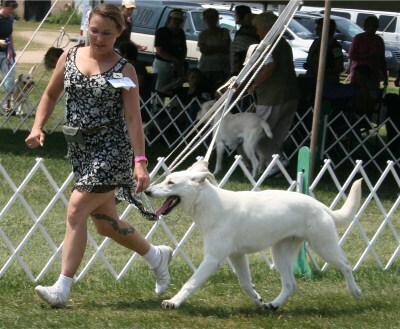 We immediately began her training for obedience & rally... she was an instant natural! I was and still am just delighted about this whip-smart little baby! Well, mostly-- it's the smart ones that are able to cause mischief! Gracie is purest snow white, not even having any biscuit on her ear-tips, and has excellent jet-black pigment, including grey toenails. She is a wonderful hopeful for our breeding program, being of a moderate to small size and substance, with a feminine head and lovely tail carriage (a problem she will hopefully help correct!) 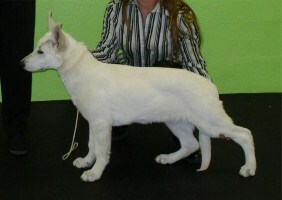 and, as conformation judge Joe Gubry, jr. said, "She's got the nicest movement he's ever seen in a White Shepherd!" 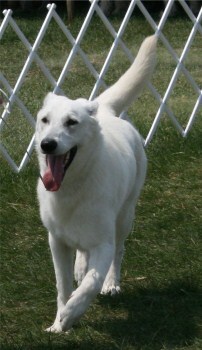 She is very pretty in movement, on or off lead- smooth, free & easy, clean coming & going, with a beautiful track at any speed. Plus she's one of the brighter bulbs on the string... being a Total Dog Participant at the 2011 Premier, with a level 1 Rally Obedience qualifying score at the tender age of only 8 months! What a total package! Expecting much, much more to come from this lovely, smart little girl! The years have gone by, and though I haven't much shown Ms. Gracie, she has become my most wonderful therapy dog, sitting through many many countless hours of being a R.E.A.D. dog at our local library, teaching the area children about how fun it is to read. Funny enough, she has friends who come over to the house to see HER! She even has a regular jogging partner now, who comes over and "picks up Gracie" for training for the "Mud Run" competition, a state-wide competition held here in Wisconsin each spring, a marathon of hard running, steeplechase, and just being a tough, hearty, endurance runner. Gracie is this fine young lady's inspiration to keep pushing herself, because Gracie says, let's go! It is amazing the friendships that Gracie has brought into my life. I could not be any more thankful.